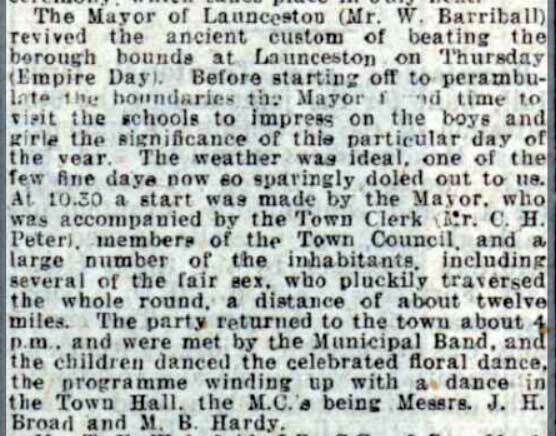 Launceston's beating of the bounds. | Launceston Then! Beating the bounds is an ancient custom still observed in some English and Welsh parishes. Under the name of the Gangdays the custom of going a-ganging was kept before the Norman Conquest. 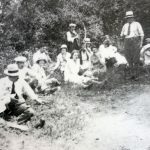 A group of old and young members of the community would walk the boundaries of the parish, usually led by the parish priest and church officials, to share the knowledge of where they lay, and to pray for protection and blessings for the lands. 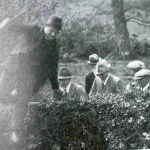 Beating the bounds had a religious side in the practice which originated the term Rogation, the accompanying clergy being supposed to beseech (rogare) the divine blessing upon the parish lands for the ensuing harvest. 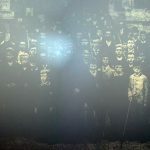 This feature originated in the 5th century, when Mamertus, Archbishop of Vienne, instituted special prayers and fasting and processions on these days. 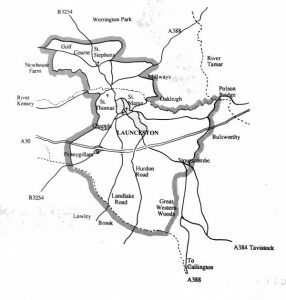 This clerical side of the parish bounds-beating was one of the religious functions prohibited by the Royal Injunctions of Elizabeth I in 1559; but it was then ordered that the perambulation should continue to be performed as a quasi-secular function, so that evidence of the boundaries of parishes, etc., might be preserved. Bequests were sometimes made in connection with bounds-beating. For example, at Leighton Buzzard on Rogation Monday, in accordance with the will of Edward Wilkes, a London merchant who died in 1646, the trustees of his almshouses accompanied the boys. The will was read and beer and plum rolls distributed. 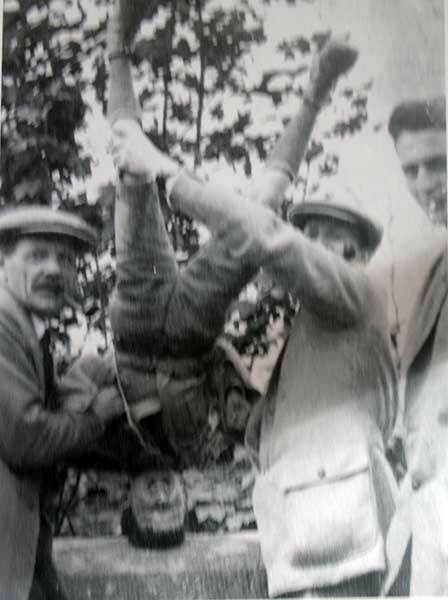 A remarkable feature of the bequest was that while the will is read one of the boys has to stand on his head. The time honoured tradition fell in use from the 1850’s but was reinstated in October 1886 by the mayor Dr. William Andrew. 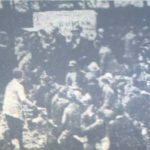 “We started away from Broad Street, under the leadership of Mr Ching, guided by Scout Edgcombe, coach builder, who, it was stated was the only man then living who had previously been engaged in beating the bounds of the borough. Arriving at St Thomas Bridge, Mr Ching gave us an address, and I well remember his “caution” about taking any apples on the route. We then made it, I should think, upwards of fifty, lining both sides of the river. 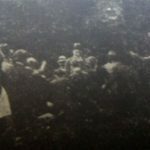 Everything went quietly until the Bathing Pool was reached, when the fun commenced, several being pushed into the water in remembrance of the day. Onwards we went to St Leonard’s, through the orchard, when the cry was heard from Mr Ching, “Apples, boys!2 and the boys helped themselves to their hearts’ content. On, then, to the Lazar Ground where your humble servant received a flogging from schoolmaster Hayne, and waded through the Tamar, preceded by Mr Julius Cater; from thence to ‘Polson Bridge’, where the borough stone was found, and J Hosking placed thereon and flogged [well known for his eccentricities and cognomen of “Forty”], after which there was a scrabble for groats, threepenny pieces, and pence. Onwards again up the lane, straight for Newton, through the gardens of the cottagers at Lawhitton Down, where, and at Newton Farm, the apples were found welcome, as most of us were getting thirsty, down by the stream under Great Western Plantation, on through the plantation under Hurdon Down, up through the valley under Hurdon Farm, to a marsh adjoining the road by Landlake, where the welcome sight of a booth laid out with refreshments by Host Cudlipp, of the Exeter Inn, was reached. 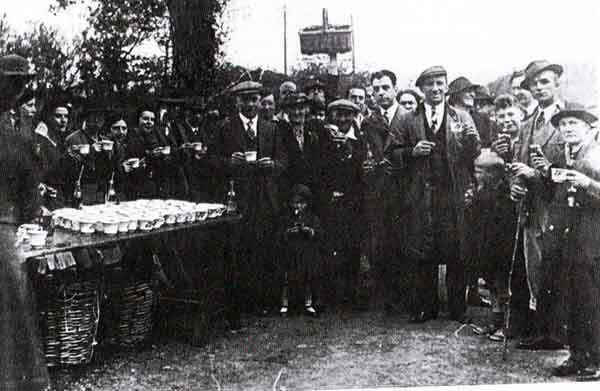 Everyone who had the good fortune to possess a ticket was regaled with a pasty and a glass of ale. One little fellow, six years of age, who had gone the whole route, being without a ticket Mr Derry took him under his special care and supplied all his wants. After a short rest, the cry was again “Forward, my lads!” to which there was a ready response. Arriving at the lane, money was again thrown among us and into the stream, which caused plenty of mirth and fun. Away up the valley under Badash and Tremeal to Tresmarrow, where the bounds runs through Mr Dawe’s dairy, and where the young “six-year old” was baptised in a pan of milk. From this point my recollection fails as to where we got into St Catherine’s Lane; I well remember coming down the lane and another scramble for money taking place by the west bridge outside St Thomas Church, which completed the round, everyone being well pleased with the days’ outing, and an old custom successfully carried out. 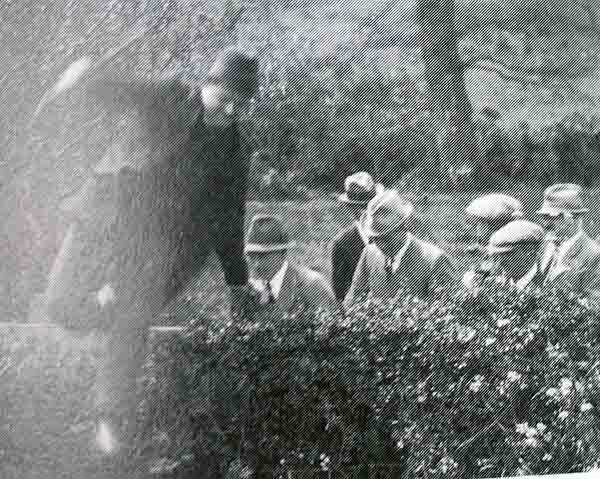 No doubt a similar outing would be serviceable and afford recreation to many in the old borough. Yours truly A NATIVE. 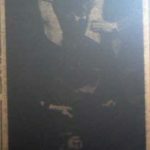 February, 1883. 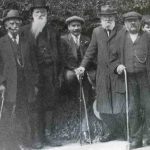 BEATING THE BOUNDS OF THE BOROUGH OF LAUNCESTON – 1886: by O.B. Peter. The Borough Bounds: From the East part of the Water of Tamar unto the end of the Hedge on the South part of the Bridge, commonly called Polstone Brigge, and so from thence, by the hedge aforesaid, as the way leads into the Dam of a certain Mill, called Bodmam-myll, and from thence, as the way leads unto the Penquite, and from thence further directly on the East part of the commons or waste, unto the Lane called Whyttee Lane, where a Cross is erected, and from the Cross unto the Corner of the Hedge of Est Haye, and from thence unto a lake called the Lake of Scardon, and from thence, as the water leads, unto Bishoppes Ford, and from thence unto a mill called Lanlack-myll as the water leads, and from thence unto Tremayll Ford, and from thence, as the water leads, unto the west part of a Tenement called Croteryn Wallis,, and from thence directly as the Hedge leads, on the North part, as the way leads to a certain Cross called Pennigillim Cross, and from thence unto Carboth, on the West part of a certain Chapel called Seint Johannis Chaple, and so from thence, with all the circuit of the Deer Park, and from thence unto the lower part of Bonyshaye, as the water leads, and from thence unto the East part of a certain Garden, called the Covent Garden, as the bank and lake extends itself, and from thence as the water has course, into the water of Kensye, in the West part of a certain Chapel called Saint James’ Chaple, and thence, as the water of Kensye has its course, to the Park of Gylmartin called the Fayre Parke, and so from thence, into the whole circuit of the ground of Gylmartin which extends itself unto the water of Tamar, and from thence as the water has its course, unto the road Bridge called Polston Bruge, which said Bridge is situate and lies upon Land parcel of the Duchy of Cornwall, as the water there extends itself and the East part of the same Bridge is situate and lies upon land which was late of the Earl of Westmoreland. And it shall be lawful to the Mayor and Commonalty of the same borough to make perambulations thereof, as often as it shall please. Above as quoted by R & O.B. Peter. 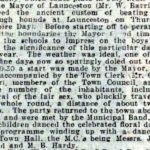 Although this revival was short lived it wasn’t until 1923 that Mayor William Barriball, revived the ancient custom for Launceston which took place on a rare sunny day on Thursday May 24th. 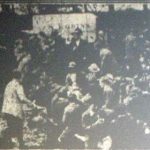 A large crowd turned out to see the start at 10:15 a.m. And a very good number set off with the Mayor, the Town Clerk (Mr. Claude Peter), the Deputy Clerk (Mr. Gerald Peter), with Mr. Stuart Peter carrying the map. The procession also included many of the Town Council members and veteran townsfolk as well as young boys and girls. At various places on the route ancient customs were observed. 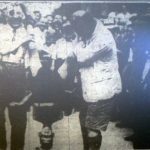 The Mayor placed Jack Hicks across his knee at one point and “thrashed” him. At his own request Scout Thorne was similarly treated. At Polson, George Fry was solemnly “bumped”. The route than lay, except for a slight deviation, along the road to Bulsworthy Lane. 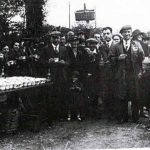 On reaching the gateway at the top of the hill, Councillor William Wise asked the Mayor to call a halt because of an event which happened there 69 years before. Councillor West apparently went around when Mr. John Ching was Mayor. 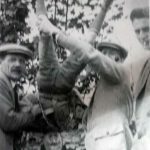 They had a holiday for the occasion and Mr. Hayne, the schoolmaster, caught him and gave him a good “beating.” “I felt it, too” said Councillor Wise. 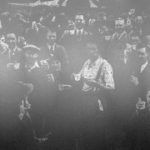 The Mayor suggested that a boy should be flogged there that day, and eventually Herbert Pearn and Dudley Saunders submitted to the ordeal. At Stourscombe Cross, where a stone sunk in the road marked the boundary, John Bridgeman and c. West submitted to their heads being “bumped” on the stone. Being Empire Day, the party stood to the salute and sang the National Anthem. 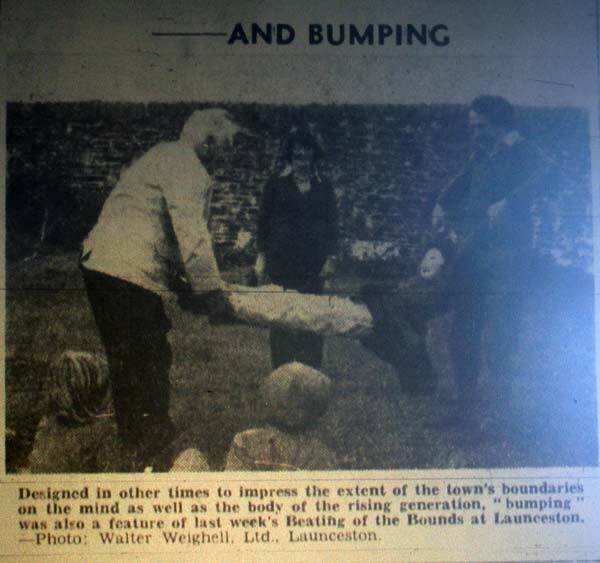 Article on the Beating of the Bounds in June 1923. 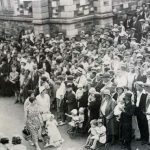 1892 Beating of the Bounds gathering outside the Town Hall. 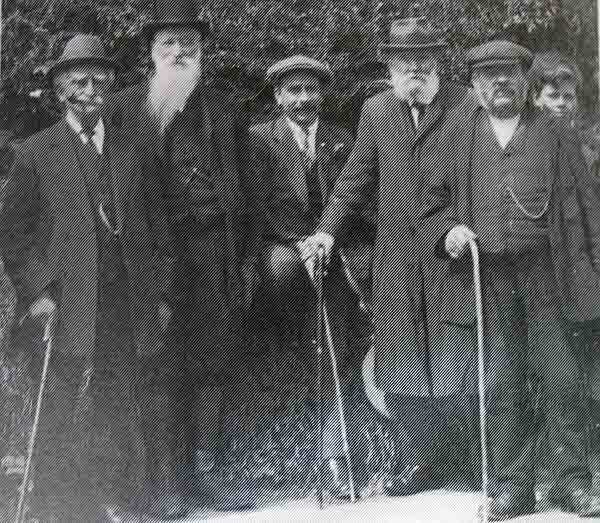 Some of the older members of the 1894 Beating of the Bounds. 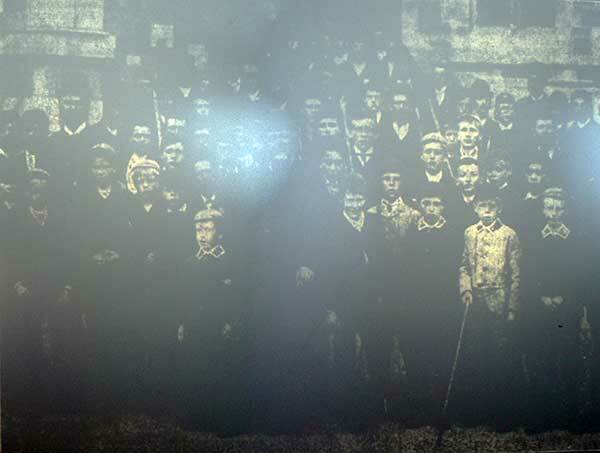 1894 Beating of the Bounds. 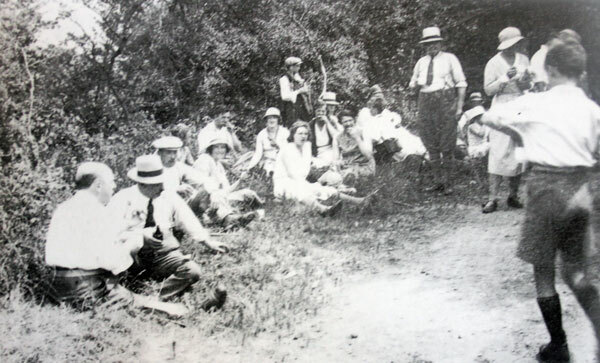 The 1923 Beating of the Bounds. 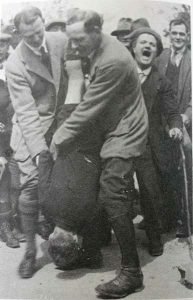 1923 Beating of the Bounds. 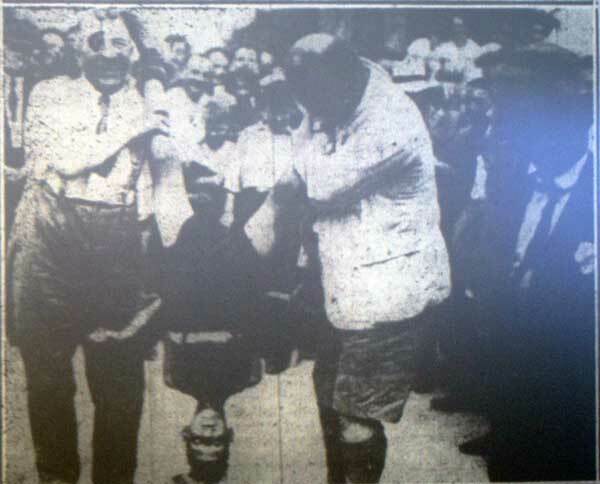 A boy being bumped during the 1933 Beating of the Bounds. 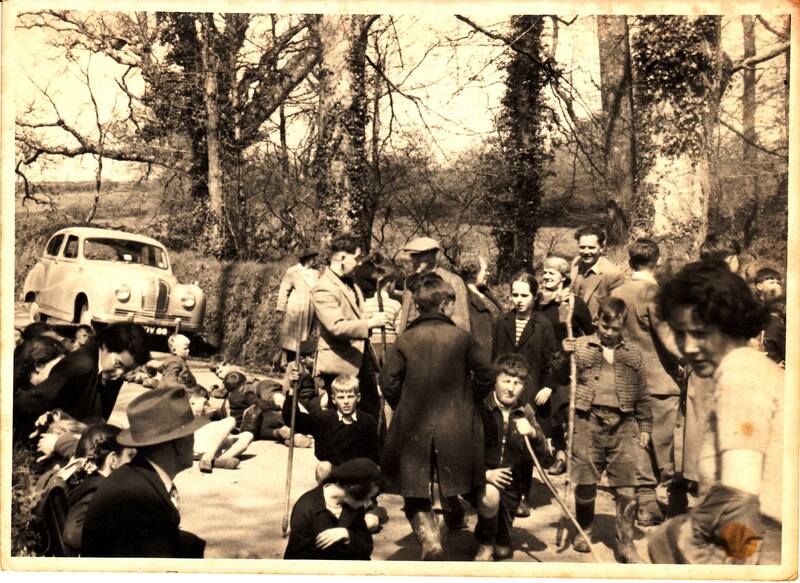 A rest during the 1933 Beating of the Bounds. 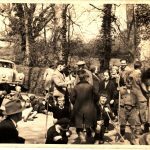 The 1939 Beating of the Bounds. 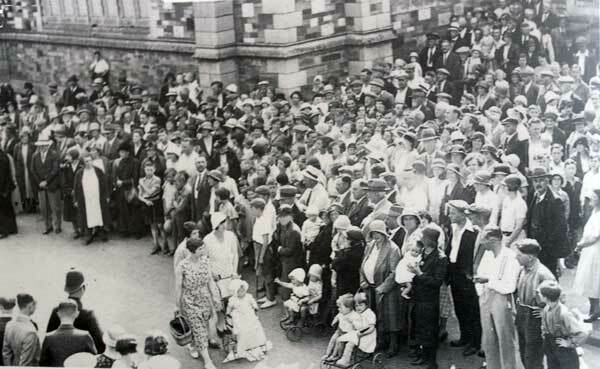 Beating of the Bounds gathering outside the Town Hall in the 1930’s. 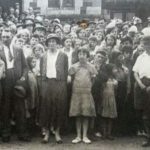 Mayor G. Trood poses with a gathering. 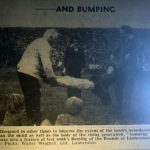 A boy being bounced during the 1951 Beating of the Bounds. 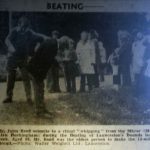 1976 Beating of the Bounds. 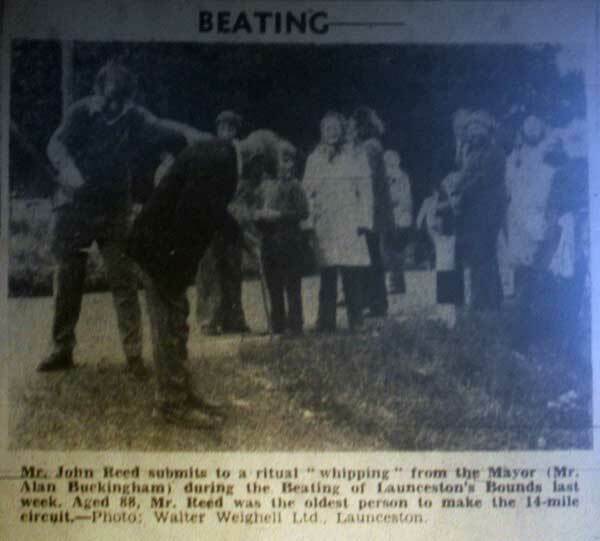 A boy being bumped during the 1976 Beating of the Bounds.